BDCOM S8500 GEPON 10GEPON OLT is a new-generation hi-end multiservice OLT access device invented by BDCOM for the convergence network. BDCOM develops the GEPON/10 GEPON card on the workstation of the S8500 switches. This service card supports 16 GEPON ports or 8 10GEPON ports, while S8500 OLT can support up to 128 GPON ports and 64 10GEPON, easily realizing the convergence of the hi-density OLT and the core switch. BDCOM S8500 GEPON 10GEPON OLT adopts the BDROS operating system whose intelligent property is owned by BDCOM, supports multiple services like MPLS, IPv6, network security, EPON non-source optical network, and provides continuous forwarding, graceful restarting and loop network protection, improving the work efficiency and guaranteeing the maximum running time. The uplink bandwidth of S8500 OLT can be expanded through adding the GE/10GE service boards. ONU provides one kilometer of bandwidth access to residential users and enterprise users. S8500 OLT EPON supports the maximum coupling ratio, 1:64, and a transmission distance of 20km. S8500 OLT 10GEPON supports the maximum coupling ratio, 1:128, and a transmission distance of 70km. S8500 OLT series products include S8510 (10 slots), S8506E (8 slots) and S8503 (3 slots). S8510 and S8506 support the control panel and power “1+1” redundancy, while S8503 supports only power “1+1” redundancy. S8500 OLT can be widely applied on the aggregation or access layer of carrier’s MAN or NGB, or on the core of automatic power distribution, electricity information collection, intelligent power’s service and PFTTH. The key modules of the system like the control unit and the power source can be backed up through the “1+1” mode. Meanwhile, the Hitless Protection System (HPS) secures the high reliability of BDCOM S8500 OLT. After the redundancy control module is configured, the highest reliability can be reached. At the same time, the functions of BDCOM S8500 OLT like VRRP, STP and LACP provide further reliability. Based on the distributive and modularized idea, BDCOM S8500 OLT uses the multi-processor-based treatment mechanism and adopts the crossbar switching architecture. This advanced system architecture guarantees the nice forwarding ability, the powerful service ability and the high expansibility. BDCOM S8500 GEPON 10GEPON OLT has L2/L3/L4 wire-speed switching ability and advanced performances like QoS, MPLS, NAT, bandwidth control and multicast. Hence, it becomes the first option for being used in the core layer of the network or for network’s value addition. Meanwhile, hardware-based flow classification, multicast, rate limitation and advanced QoS give strong supports for users to operate the value-added services. BDCOM S8500 GEPON 10GEPON OLT supports the 952Mpps packet forwarding rate, contains 512K layer-3 routing information, 512K layer-2 MAC addresses, 4096 groups of VLANs and 8K security/ access control policies, securing the wire-speed forwarding requirements. 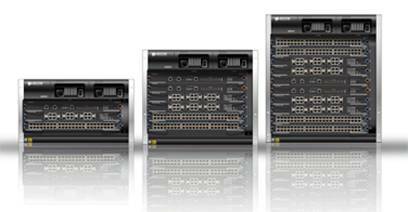 BDCOM S8500 GEPON 10GEPON OLT supports various interface types such as 10GE, GE, FE, GEPON and 10GEPON. High port density, wire-speed routing/switching can thus be really reached. The whole system provides up to 128 PON ports, 64 10G interfaces and 384 gigabit interfaces. Additionally, the system also has sound anti-virus mechanism, providing security to network operation. All IPv6 technologies are realized, including IPv4/IPv6 protocol stacks, and IPv4-to-IPv6 basic filtration technologies based on manual/automatic tunnel configuration or 6-to-4 tunnel. Meanwhile, the IPv6 static routing is realized and the dynamic routing protocols such as BGP4/BGP4+, RIPng and OSPFv3 are supported. The layer-2 MPLS VPN supports the Martini protocol and the VPLS protocol, while the layer-3 MPLS VPN adopts RFC2547bis. Hence, BDCOM S8500 OLT is well compatible with other main manufacturers’ devices on the MPLS VPN service. It supports the RFC 1213 SNMP protocol. The internal network management mode adopts the Telnet-based configuration management or the SNMP-based configuration management, realizing uniform network management based on the Broad Director network management platform.